This Carnival Birthday Party is certainly one of my favorites. It turned out so colorful and fun! A heavy fabric backdrop with red curtains and balloons set the mood for a circus tent with our own ring master, cheeky monkeys on a hoop and a funny clown, made specially for this party. The table featured carnival foods such as pop corn, candy apples, peanuts, marshmallows, sugar cookies, gumballs, swirly lollipops, brownies and cupcakes. A beautiful three tiered cake by The Cake Factory completed our setting. We also created a canopy with custom made carnival games, such as ring toss, can toss, bean bag toss and a duck matching game, along with many other games which the kids would play for fun prizes. A bouncy castle and carousel completed the fun and made this party a huge success. 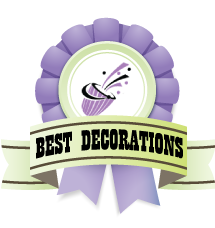 Our friends from Party Pail have awarded us with the Best Decorations Badge on their site. Thank you so much, Jenny! We are beyond honored!